The Ninth Edition of the Atelier’s Campus Theatre Festival kicked off on the 21st of February 2016. The festival which is scheduled to go on for the next couple of days has already seen a huge response from theatre enthusiasts across Delhi. 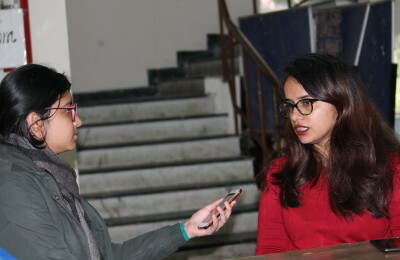 The festival was inaugurated at the Stein Auditorium in the India Habitat Centre where two plays were staged: St. Stephen’s College’s “Snoop Dogg” and Hindu College’s “Characters Revolt”. Characters Revolt, performed by Ibtida, one of Hindu’s two dramatics societies followed the story of three guys who on the night of their graduation from college, bring home three girls to complete a pact they had once made. Yet events take place in not quite the manner they expected them to take place in resulting in a series of comical events. “The ACT Festival provided us with perhaps the best and most prestigious platform for performing our production this year. E venue, the equipment all of it was amazing.” Said a member of the Ibtida team. The second play of the night was Snoop Dog, an original script inspired by Manto’s “Dog of Titwal” directed by Ruchi Chaudhury. The socio-political satire on the norm of raging intolerance and jingoistic patriotism won the hearts of everyone in the auditorium. Festival director Mr. Kuljeet Singh,himself, hailed the team for their brilliant performance bringing the first day of the festival to a fantastic end. Day 2 of the festival which was to be held at Sri Venkateswara International School, Dwarka saw turns in the schedule. With the jat agitation raging across the streets of Delhi, which followed Delhi Government’s order for schools remaining closed that day, the street theatre performances by three colleges were postponed until further information. However, the stage theatre festival later that day enthralled the audience at the American Center, New Delhi. The first stage play of the festival was performed by Masque, The English Dramatics Society of Hindu College. The team performed their annual production “Trips” at the American Centre, New Delhi on the 22nd of February. The play focusing on three hitmen waiting in a room for a stranger to arrive with the simple objective of ending his or her life managed to create an atmosphere of suspense and fear in the entire auditorium till the very last minute. “We were really happy with our performance and were delighted to receive such an amazing response from the audience, Atelier’s has been amazing to us and we hope to be back next year as well”, said Shivish Soni, one of the two directors of the play. The following day kicked off with much fervour and zeal when the dramatics societies of Lady Sri Ram College, Hansraj and Shaheed Bhagat Singh College took the audience by storm with the staging of their annual productions. LSR’s “Sun! Tu Rehne De” challenged the conventions and notions of the society on Homosexuality and was a mockery of Section 377 of the Indian Penal Code which criminalises sexual activities that are “against the order of nature”. “Rivayat” by Hansraj was a stand against the ‘Indian democratic-autocracy’ that favours the top. Emulating episodes from the lives of Eklavya, Aurangzeb, The Aryans and Jessica Lal, it emphasized that it was time to become detached from the historical convention of Rivayat. The third street play of the day, “Namaste…Mera Naam Hai Nakli!” was performed by Natuve, the Dramatics society of SBSC, which was a very different take on the issue of open economy. Conceptualized on the lines of Ramayana’s Sita Haran episode, the play delved into the revival of the Indian market and its producers, which is slowly disappearing due to our increased dependence on Chinese goods and products. “All the incidents that were shown in the play were non-fictional, including those which talked about ordinary people. This may not seem a topic of much importance, as of now, but ten years down the line, this will surely become a very grave social issue. We thought it was imperative to take an effort and spread awareness, before it gets too late.” said a member from Natuve. The team from Indira Gandhi Delhi Technical University for Women performed on Day 3 in lieu of their performance on the second day. The team emerged out as the only college not belonging to the Delhi University to perform their annual production “Bezubaan” in the first half of the festival. The latter half of the day did not disappoint either with Verbum, the Dramatics Society of Sri Venkateswara College staging their production “Veronica’s Room” at the same venue. The play which started off with a girl attempting to help a family by performing a selfless deed took a dark twist leaving the audience confused and captivated as Venky’s plays always do. As the stage play events move to other venues, Atelier’s can be proud of the fact that both days saw a filled auditorium of 140 to 150 people. “The edition of the festival has seen a wide range, this year. With regard to thematic range, it is more developed, evolved and myriad. And in terms of performance, couple of plays really impressed me like those that were staged on the first day of the festival – one by Hindu, another by Stephen’s, and I am looking forward to a couple of more plays at Akshara Theatre. Shakkar Ke Paanch Daane, LSR’s Nine Parts of Desire and SRCC’s Blithe Spirit seems to be very promising productions.” is what the Director of the festival, Mr. Kuljeet Singh has to say!